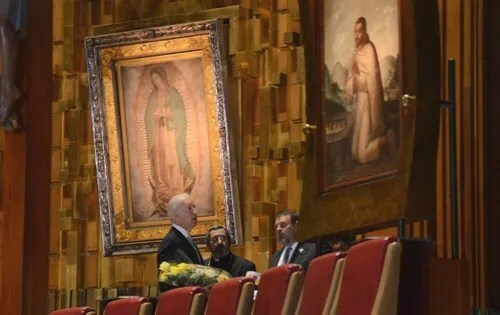 There was a great little story on the Catholic News Agency about Vice President Joe bid en’s visit to the Shrine of Our Lady of Guadalupe in Mexico. He prayed and was very moved. Here is part of the story below. May I suggest that the Vice President study the image of Our Lady of Guadalupe. That he gaze upon her belly, swollen with her unborn child – Our Lord Jesus Christ. He should also meditate on the human sacrifice that took place in the culture and was stopped immediately by Our Lady’s Apparition. Maybe, Mr. Biden is being used by Our Lady to begin a new work for the end of the “human sacrifice” we call abortion, taking place in our nation today. And, all of us need to pray for Joe Biden, that he fully embrace his Catholic Faith as did many of the saints and martyrs of old. Could it be that Our Lady of Guadalupe is calling the Vice President to be a strong and vocal voice for the New Evangelization, like the one she began in Guadalupe? I offer my prayers for V.P. Biden through the intercession of Our Lady of Guadalupe.